I hope your week is going well. In our house, we call Thursday, "Friday Eve". So, happy Friday Eve! 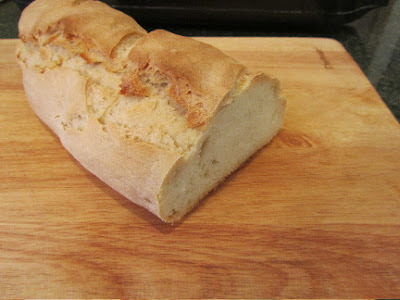 I had some serious sourdough bread cravings earlier this week. I got my sourdough starter fired up again, after a lot of neglect this winter. I left the sourdough sponge on the counter overnight, hoping to achieve a really good tang. It still turned out rather mild. I'll keep working on that tang that I crave. 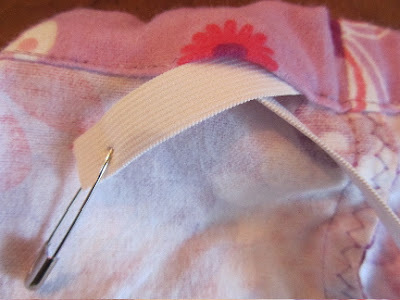 For now, though, I thought I'd share my adventures in sewing pj bottoms for my two daughters. 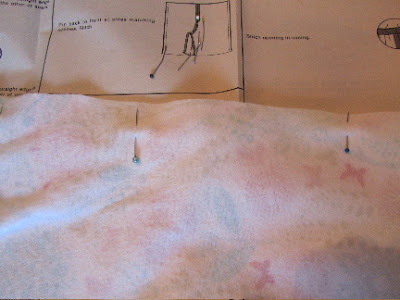 For anyone interested in learning to sew, I wanted to show the process, so that you could determine for yourself if this was a project you would want to undertake. I have a short attention span for these sort of projects. I don't like to unnecessarily frustrate myself with a long stretch of sewing or other needlework. So, I limited myself to about 45 minutes to 1 hour at a stretch on these. It took 4 days of work to complete both pairs. If I was one who could tolerate doing it all in one stretch, I could have made these two pairs in about 3 hours (but I would not have been a happy camper at the end of it all -- hence breaking my work up into chunks). I worked on the 2 pairs simultaneously. I pinned and cut out both pairs together. I sewed seams one pair right after the other. I hemmed and put in elastic waists, one pair followed by the second. This seemed to be the most efficient use of my time. My only wish is that I'd done a third pair, one for me!!! Day 1: I sized down the pattern that I had for my own pajamas, from a Women's size 6-8 to a Junior's size 3-5. It was all guess work, as these were to be a gift, so done in secret. I used white tissue wrapping paper to transfer my pattern to. It's not as transparent as pattern paper, but it worked fine. First, I laid out the old pattern on the table, traced the cutting lines for my size onto the white tissue paper. 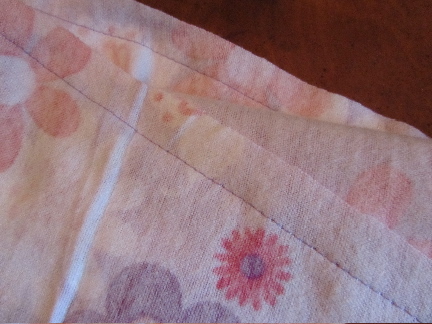 Then, I re-drew the cutting lines about an inch in on the straight side seams, and took up the hem by several inches. That was it for Day 1. It took about 45 minutes (a lot of time spent wondering if I was on the mark, size-wise). 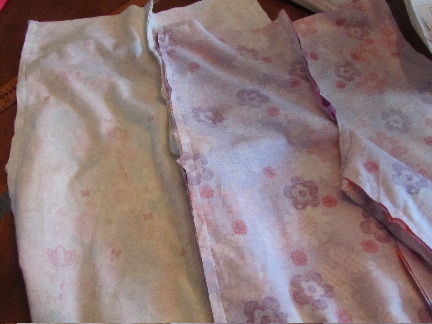 Day 2: I pinned the new, white tissue pattern pieces to the fabric, and cut out. Again, for both pairs, this took about 45 minutes. then, sewed the two front halves together, two back halves together, the inner leg seam, and the side seam. I trimmed and reinforced all seams with a zig zag edge, very close to the straight stitching. This took me longer than previous days' work, about 1 hour 15 minutes. Day 4: I made the casing for the elastic waist, hemmed the legs, ran the elastic through the casing (using a safety pin to help thread the elastic), and sewed the little flower trim to the center front. I was done in about 45 minutes. And both pairs were complete. For winter wear, I used flannel. Summer pj bottoms could be made from a woven cotton. I'd like a seersucker pair myself for wearing around the house on lazy summer days. 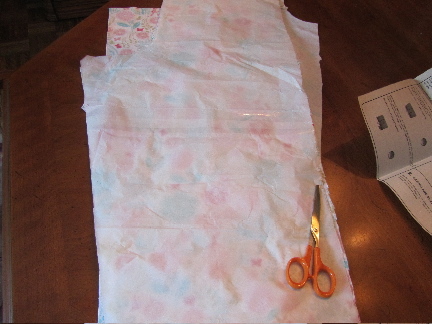 Pj shorts would be even quicker to whip up, with shorter seams. If you have several kids to make pj bottoms for, (and you'd like them all to be of the same fabric -- some families do this at Christmas), you can use flannel sheets for the fabric, and save some money on the project. 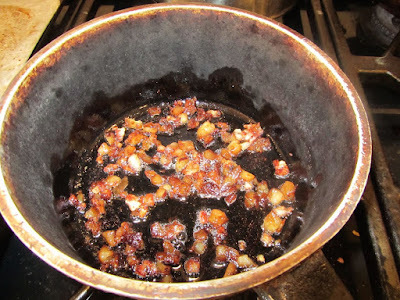 You can see how they turned out. I was surprisingly close to accurate in my guesses on their size. I had left a tiny bit of stitching undone on the waistband casing, so that I could adjust the waist if necessary. After they tried them on, I closed up that small gap, and now I can hardly get my daughters out of their pjs on the weekends. 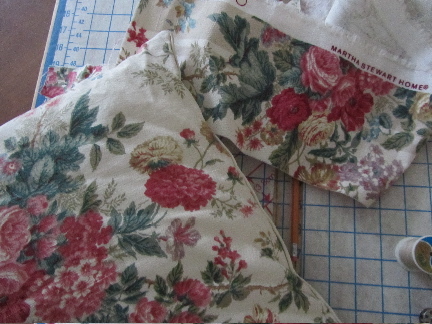 I'm beginning a small sewing project, using the scraps from this pillow that I made for the family room. More on that project another day. Thank you for visiting today. It's been good to have you here. I hope that you found inspiration, ideas, or just moral support, for your next project. May your day be full of cheer! This is fantastic! 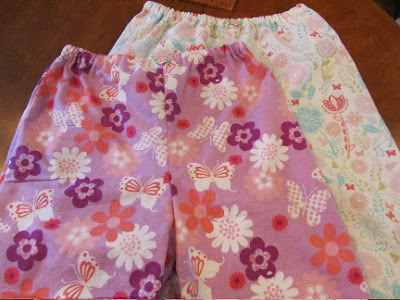 I had been thinking about making pyjama pants for my three little girls. I found some adorable flannel on tremendous mark down yesterday. I wasn't sure about this project. But I'll go back this morning and buy what I need. What about pyjama tops? What did you do for the shirts? Thank you! For the tops, one of my daughters found a t-shirt at Value Village, just this week (on 50% off day, Monday) to use as a pj top. And my other daughter had a pj top, minus bottoms, that actually goes quite well with hers. I had thought, though, that they'd wear one of their many short-sleeved, but oversized, t-shirts that they've gotten from our church with each summer's VBS. They had their own ideas, which works, too! Good luck with your pajama project. This is an excellent time of year to buy flannel at the fabric store. I noticed the Jo-Ann's near us was getting all their spring fabrics in, and marking down the more wintry bolts of fabric. Hi there! Really easy, you say? My husband gave me a sewing machine for Christmas and I've been afraid to try anything too difficult. You see, I'm a beginner at sewing. I've made an apron, and mended some clothing, but that's all that I've used my new machine for. Once again, these are easy for a beginner? Just want to make sure I don't get in over my head. Thanks for your encouragement. ps--I'm signed up for a sewing class beginning next Thursday. I'm supposed to bring a pattern and fabric. Maybe for some of these? Well, I can only give you my opinion. If anyone else would like to chime in, please do so. Elastic waist pants, like pj bottoms are the simplest form of pant to sew. And since they are pajamas, they are supposed to be baggy. So there is no special fitting involved! There are no buttons or button holes or pesky zippers to work in, so it's just seams. hem and elastic/casing. Pajama bottoms are definitely a simple project. And since you are taking a class, why not do a pair for the class? Make this your project, then if you run into anything that troubles you, your instructor will be able to give you hands on help. But I think you'll be surprised just how easy they are. Best of luck to you with this project and your class. How very fun to receive a sewing machine for a Christmas gift! Lucky you! Absolutely love the martha stewart material you'll be using for your next project. Can't wait to find out what it is! It's a pretty fabric, isn't it? I eyed it for a couple of months, one summer, and finally it went on sale! Love when that happens -- patience can pay off! I'll tell you this much, I've been going through my boxes of scraps, and picking out the ones that I love most, first. Many of these scrap pieces are fairly small, so I've been thinking of ways to use small bits. It's not patchwork, but just a small little item I'll be sewing, to give away. I'll show you in a couple of days. Just have to find the time to dive in. I've been sewing for years partly because I'm frugal and mostly because I'm tall and its hard to find clothes with long enough sleeves or pant legs. My sewing room isn't heated so once I decide to do a project,and heat the room with a space heater I tend to put in long hours at the machine. Did you use the girls existing clothes as a guide when you altered the pattern or strictly eyeball it? Thanks! I used one pair of pj bottoms to get an idea of length, and just knew their waist measurements, so I could guess at how much to take the sides in. Luckily pjs are supposed to be baggy, so my guesses only had to be approximate. Good for you, to be able to work nonstop on a sewing project. And I can totally understand the reasoning to do so. If I had to specially heat a room for sewing, I might come to the same decision. You've almost inspired me to break out the sewing machine as I can't seem to find what I want in the stores. Some day this simple project will make it to the top of my list. I feel the same way at times, that the stores just don't have what I know I want, and what I know will look good on me. I wish I were more the seamstress to just whip up whatever I think up. But at least with a simple project like pj's, I can do a good enough job of it. I'm planning on making a pair or two from woven cotton, just for knocking around the house and garden this summer. Interesting how you break up your sewing time. I'm trying to do that because I don't have big chunks of time to sew right now. (plus the basement's cold!) The only problem is that once I get working on a project, I usually want to keep going! There is something fantastic about warm jammies, getting cozy and calling off work for the rest of the evening! Now I'm wishing today were just about done! I do have occasions where I keep on working on a project until it's finished. But more often than not I just plan things out to only do a portion at a time. Just works best for me. Yours are wonderful, I hope your girls liked them. Thank you. And yes, my daughters do love them! I do think pajamas are one of the easier projects to tackle with sewing. And as you said, it's not like they'll be seen a whole lot of people. But I think you'd do a great job. Your needlework is so beautiful. You obviously have a talent for creative endeavors. I'd love to see what fabric you'd choose. Good luck if you choose to try making a pair for yourself! You know, if you wanted to see if sewing was for you, some fabric stores offer sewing classes, where the machines are provided for the student's use, on site in the store. And some community adult education programs also have sewing in their course catalogs, sometimes with sewing machines available. Just a thought. 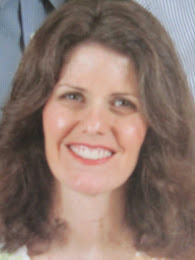 It would be helpful, for a first project, to have someone who could be a guide or instructor. They would help you figure things out with the machine (like threading, and trouble shooting bobbin problems), and encourage your efforts along the way. It's a shame about not having access any longer to a machine, but if you're really interested in trying out sewing, it's like everything else in life, something will turn up! 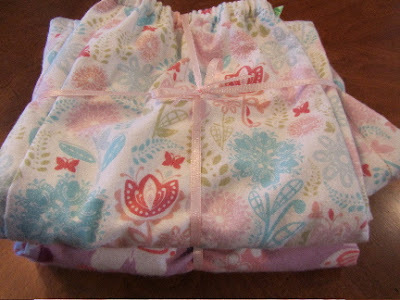 Job well done with these pajama bottoms-how sweet of you to make these for your girls. My sewing machine sits alone waiting for some attention! Just maybe I will show it some love and try this idea out. I do like how you broke your project up. Maybe that is the key to not get in a hurry or discouraged. Thank you for these useful tips!! Have a warm and cozy evening! Thank you. I truly enjoyed making them. I think taking this project slowly helped me to enjoy the process. A warm and cozy evening is just what I'm hoping for, as we had a cold and blustery day today. Thank you for the kind wishes!